Mattress company Casper today revealed its first non-bedding product, called the "Glow" lamp. 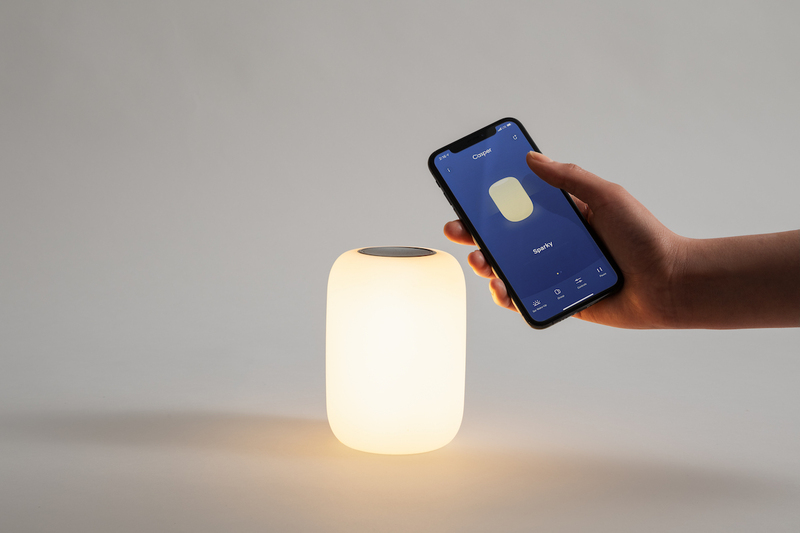 The device is a 5-inch tall by 3 inch wide HomePod-shaped smart light that connects to your iPhone, allowing you to set sleeping and waking light patterns and encouraging a more restful sleep. The Glow lamp does not support Apple HomeKit. The Glow charges on a wireless charging pad, allowing you to pick it up and move it around freely. Casper says that it was designed to be used when you're the most sleepy, so it has no top side or bottom side, allowing you to place it in any orientation. Flipping it switches the Glow on, rotating it increases or decreases the brightness, and wiggling it will turn on a small amount of light. 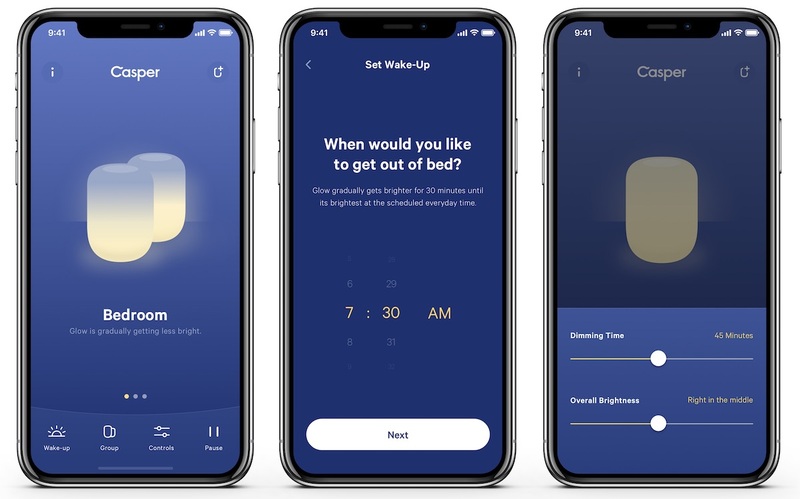 Similar to Night Shift on iOS and macOS, the Glow was built to ensure that the user doesn't face any harsh bright lights right before bed, which could disrupt sleep patterns. The default mode on Glow is a 45 minute cooldown that gradually dims the light until there is none, and in the morning it will gently wake you up by filling the room with soft light. Multiple Glows can be synced in one bedroom, so that when one is controlled they both adjust light to match one another (up to six can be connected via Bluetooth). You can buy the Glow today for $89 in a single pack or $169 in a double pack. Not supporting HomeKit is the kiss of death for this. Why would I want to download another app just to control a night light? I have other lights in the bedroom that are all HomeKit compatible so they all work in unison. Welp, the HomePod Jr. is adorable. Ah man, they had me thinking this looks pretty nice. Then start reading "The Glow lamp does not support Apple HomeKit", then it's a no go for me. I don't need another item using it's own app to do stuff. I want everything under one location. 2. It's important to work with both sides of the sleep cycle: warm, soft light in the evening AND cool, bright light in the morning. Both are important parts of circadian rhythms. Some are missing the point of this lamp, regarding HomeKit. First, voice control not a good option at night if one has a partner in the room. Telling the lamp to turn up in the middle of the night annoying. Additionally using the Phone App to get the lite to function in the middle of the night also annoying. The in hand control very attractive features. I see it being used in dark hotel rooms as well as at home. The interaction with the app seem minimal. Once set, pretty much in hand functions are the preferred choice. Speaking about innovation, well bought out. HomeKit, Alexa, Hey Google, maybe. The hand interaction really innovative in the sleep envioniment. I think you are missing the point of HomeKit. It's not just being able to have voice control. I have a few buttons in my house, one by my bed, and one by the front door. These run automations to shut down the house (thermostat / lock doors / lights off / make sure garage is closed). Having components missed is a bummer. I like to be able to in one single button or event shut everything off in my house. Also, being able to check in one central location if things were left on is convenient. And any other automation you want to set. For instance turning the lights on when you walk in the bedroom. That thing is dim. Only 280 Lumens max. Fixed on 2700K. And of course no HomeKit. Looks cool but at $89 a pop and no Homekit. Sorry, I'll pass. Too expensive for what it is. 100%. Is it that hard to make it HomeKit compatible? Why do so many vendors not support it?